How to Make Lemon Pie. Combine a little bit of sweetness with a little bit of tartness, and the result is a whole lot of flavor. Old fashioned lemon pie requires a little extra time and effort in the kitchen, but when you taste the result, you won't regret it. Fluffy meringue on the top will finish it off in grand style. Combine 1 cup sugar and the cornstarch in the top of a double boiler. Mix in 2 cups of water. Cook the mixture until it's thick and smooth, stirring often. Remove the mixture from the heat. Separate the eggs and beat the yolks in a medium mixing bowl. Slowly add the cornstarch, whisking constantly. Save the egg whites for the meringue. Add the egg yolks to the cornstarch mixture in the double boiler, return it to the burner and whisk constantly for about 2 minutes. Take the mixture off of the heat and stir in the lemon juice, zest and butter. Allow it to cool, and pour the cooled mixture into the pre-baked pie crust. Place the egg whites in a large glass or metal mixing bowl to make the meringue. Beat with an electric mixer until foamy. Incorporate 6 tbsp. sugar slowly, beating constantly until the sugar is blended and the mixture turns stiff. Spread the meringue onto the lemon filling in the pie shell. Make sure the lemon filling is completely covered. Bake the lemon pie at 350 degrees F for 15 minutes or just until the meringue turns golden brown. 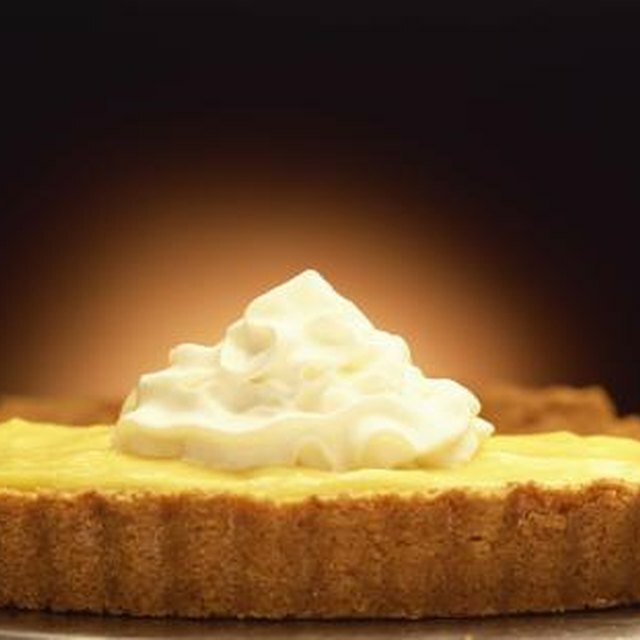 Chill the lemon pie in the refrigerator and serve it cold. How Do I Thicken Blueberries to Make Pie Filling?